Some of you may remember that last year I sowed some hardy annuals in September as a sort of experiment. Here's a summary. This was a success and we were cutting flowers from this bed in May and what's more the plants had much stronger stems than the later sowings. This year I had intended to do the same thing but circumstances conspired against this plan. We couldn't get to the plot so on 16 September I resorted to plan B. This was to sow the annuals in modules and plant the seedlings out later. I sowed some seeds left over from spring sowing but I bought a couple of varieties to supplement these. The trays were placed on a patio table and just left to the elements, just as they would have been if sown direct. 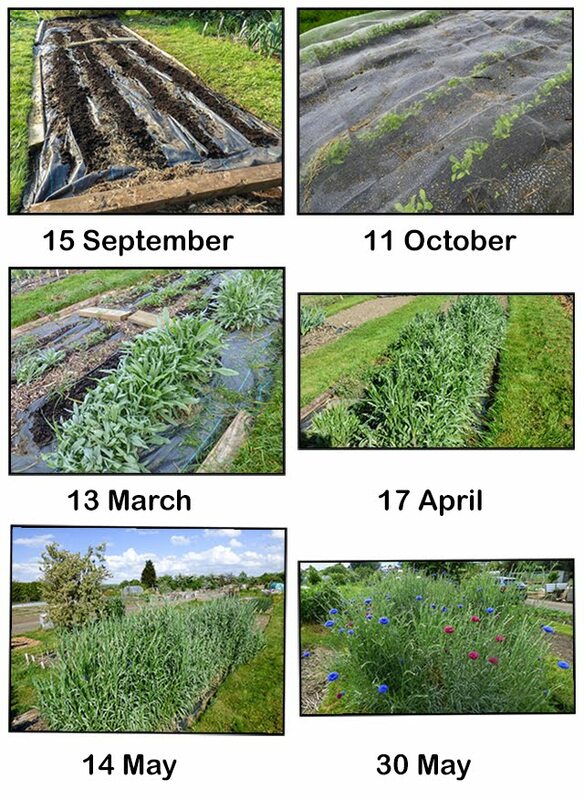 The cornflowers germinated quickly taking just over a week to show through the compost. By 8 October most of the seeds had germinated with the exception of the godetia which was fairly old seed. 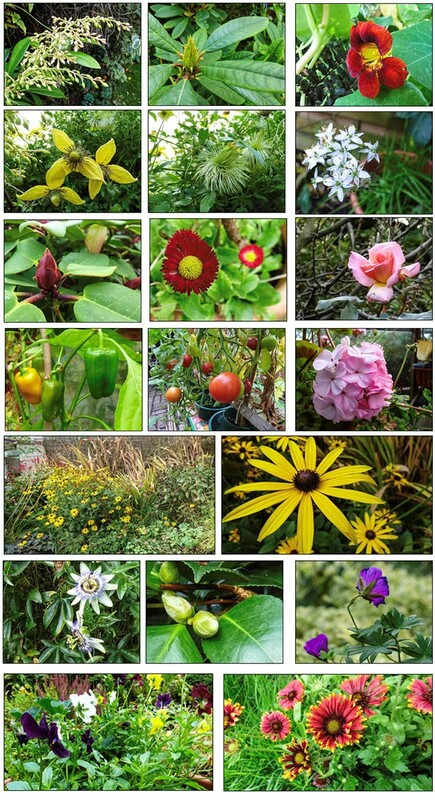 The seedlings looked as shown below on 20 November. It's really the best success that I have had in germinating larkspur. So for the dilemma. The seedlings still don't look sturdy enough to survive the trauma of being planted out on the plot. It is also rather late to be planting in the now cold soil, so I am now moving to plan C. This is to leave the seedlings in the modules and move them either into the cold frame or cold greenhouse when the winter weather is at it's worst. The danger is that they may be forgotten and dry out, so I will have to make an effort to look after them. If they survive the plan is to transplant them out on the plot as early in spring as possible when I think the conditions are favourable. I wonder whether there will be a plan D? We didn't go to the plot last week, mainly because we had a few days out visiting various places and shopping for now much needed thermal underwear. The days that we planned to visit the plot were cold and miserable and so we opted for curling up on the sofa. Martyn started going through and editing the masses of steam engine video that we took on Saturday and I did a jigsaw puzzle and read an ebook on my iPad. I wasn't going to write a harvest Monday post, until Martyn reminded me that we had been harvesting watercress, and I thought that it was worth mentioning that the watercress is still flourishing despite a couple of early morning temperatures falling to around zero degrees. It will be interesting to see just how low a temperature it can survive and whether the roots will survive over winter even if the top is knocked back. Then when I popped into the greenhouse I had a little surprise. Most of the greenhouse tomato plants have been cleared, but a couple in pots that still had tiny fruits, were left in the unlikely event that the fruits grew and ripened. In fact that is exactly what had happened and there were three ripe Golden Crown tomatoes just asking to be picked - so I did just that. So there we have it our very tiny harvest. Does this count as a harvest? Usually on a Monday, along with other bloggers, I join Dave over at Happy Acres and share the previous week's harvest. Last week we didn't really harvest any vegetables. It isn't that we don't have anything to harvest. We have the usual winter crops but we just didn't need any fresh supplies at home. I wondered if I could stretch the term harvest to include a non-edible crop. If harvest means to gather and if a crop can be anything grown with the intention of harvesting from it then maybe I can include flowers. After all, when I was teaching we decorated the church with fruit, vegetables and flowers for the annual harvest festival. So here is my last week's harvest. Unlike the dahlias, the chrysanthemums survived last week's frosts. The dahlia tubers will need lifting and storing overwinter. According to James Wong the tubers are edible. Apparently the plants were first brought into the country as an edible crop. We won't be eating ours. Has anyone ever tried them? The chrysanthemums may have survived the frosts but the wind has had an effect on the plants. Most things on our plot lean to the east. Next year I'm hoping to grow all the chrysanthemums in one bed, that is if they make it through the winter. I'll then be able to stake them to try and combat some of the wind effect. possibly being included on their blog. As it came at a time when we were spending more time indoors, I decided to send them a story. The event that I decided to share was when we uncovered a nest of hedgehogs back in 2005..
Then last week I received another email saying that my story had been chosen for inclusion on the Walton's blog along with stories from another five bloggers. (maybe they only received six stories). They went on to say that they were entering the six stories in a competition that they were running, something that wasn't mentioned in the first email. I don't expect to win the competition but hopefully I will receive some votes so that I'm not too embarrassed. If you wish to vote for one of the stories - not necessarily mine there is an option to do this. We have only a small harvest to share with you this week. Things are starting to fall off as we head towards the time when the allotment is somewhat dormant. Also we have vegetables in storage that we are using and so we are only harvesting the vegetables still on the plot as we need them. Most will spend winter in the ground and be harvested as required. Despite that we have had a couple of firsts - leeks and parsnips. The carrots continue to be disappointing and will require a fair bit of preparation before using. Some of the parsnips are forked and, as you may have noticed above, are proving difficult to remove from the hard ground. We wonder whether the ground suffered from lack of moisture over the growing season meaning the beds became hard and dry where these crops were growing. Once the plants had taken off we maybe neglected them in favour of plants that displayed more obvious signs of suffering through lack of water. 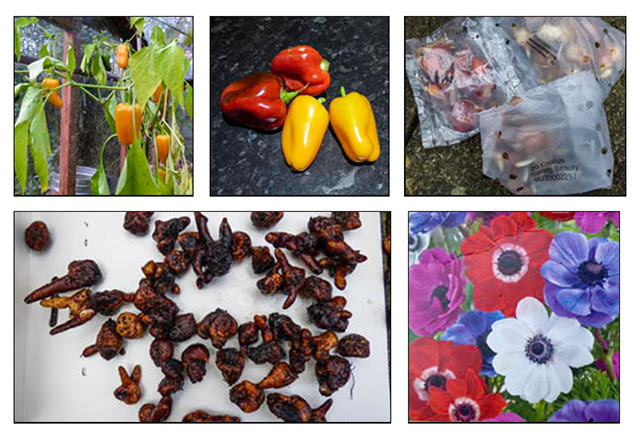 As a drop in temperature, with a possibility of frost, was predicted I decided to pick all the fruits off the sweet pepper plants in the greenhouse. This was a good decision as on Monday morning there was an icy covering on the cars. The small Snackbite peppers have done well and provided us with fresh peppers to add to our lunch time sandwiches. Definitely a variety to grow again. 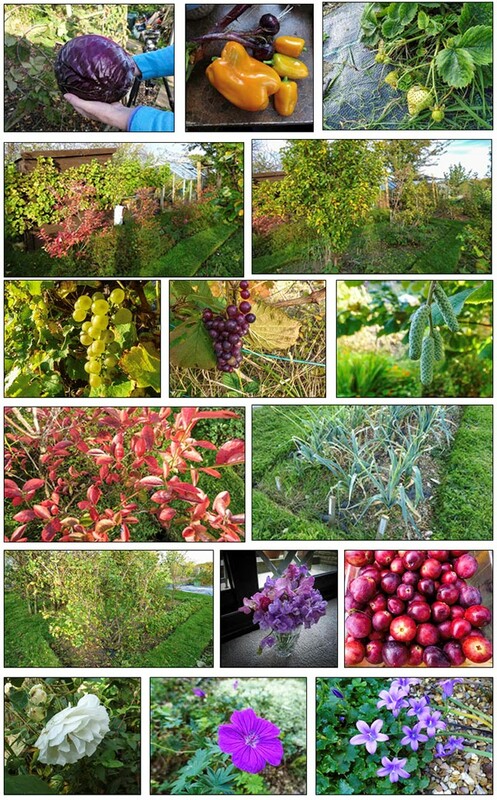 The only disappointment was that none of the plants seemed to produce red fruits. Although this strawberry flower on Sunday showed no sign of being frosted, I imagine that today things will look different. With harvesting taking less time we are concentrating on tidying some areas of the plot and emptying compost bins. Martyn put together a video showing some of our weekend activity which can be viewed here. I've removed all the dead leaves from the chard and am now wondering if the new growth will last over winter to provide us with some greens. Maybe Lou over at Rainbow Chard can give us some pointers about growing chard as the seeds that I sowed later in the year, which were supposed to provide winter vegetables, didn't do very well. This was mainly down to slug activity. The same is true of the later sown spinach and pak choy. It's a group of vegetables we haven't much experience in growing but I am keen to learn. Another job of mine was to prune the quince tree. It's goal is to head skywards and my goal is to prevent it doing so. Each year I thwart it and cut back all the upward growing branches. The end result is more like a weeping tree. It doesn't seem to resent this treatment too much as it usually produces a good crop of fruit with the bonus of it all being in easy - at least for Martyn - reach. We now have a house full of chrysanthemums rather than sweet peas. However, incredibly we did manage to pick a tiny posy of sweet peas and lavender. Each week I create a photo collage which sums up our week. It mainly focuses on gardening but sometimes other events are thrown into the mix. The photos form the main part of a dairy page on our website which also has brief notes and blog links to both of our blogs. If you are interested in visiting the October page is here. 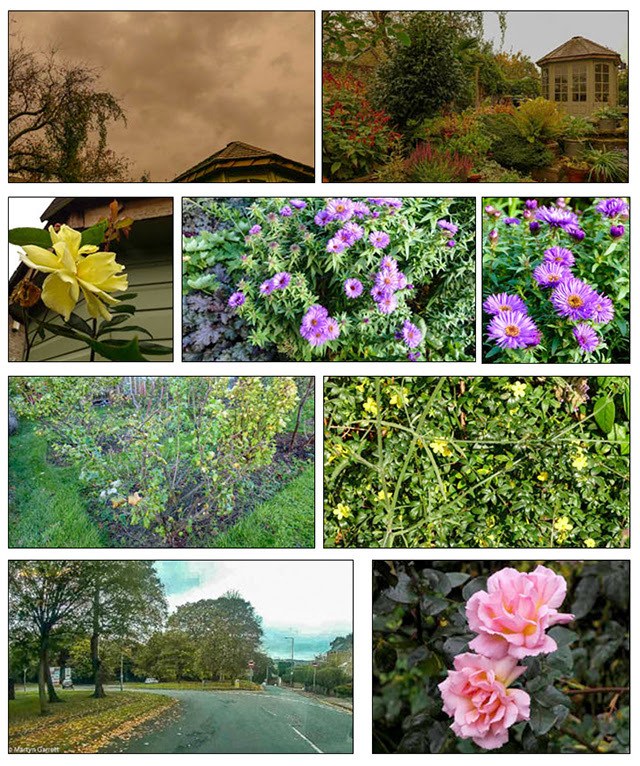 Here is October's photo collection that are representative of the 232 photos that I kept for October with lots more discarded. If you enjoy watching videos we also have a vlog which mainly hosts Martyn's videos but I have added one or two of mine too. 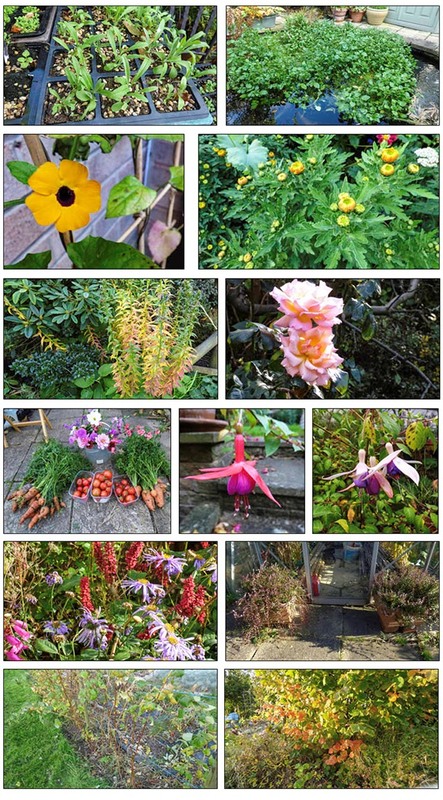 Don't forget Martyn has a blog A Gardener's Weather Diary which records our gardening antics from his point of view.